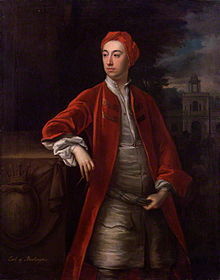 Richard Boyle, 3rd Earl of Burlington and 4th Earl of Cork, KG PC (25 April 1694 – 4 December 1753) was an Anglo-Irish architect and noble often called the "Apollo of the Arts" and the "Architect Earl". The son of the 2nd Earl of Burlington and 3rd Earl of Cork, Burlington never took more than a passing interest in politics despite his position as a Privy Counsellor and a member of both the British House of Lords and the Irish House of Lords. Lord Burlington is remembered for bringing Palladian architecture to Britain and Ireland. His major projects include Burlington House, Westminster School, Chiswick House and Northwick Park. Lord Burlington was born in Yorkshire into a wealthy Anglo-Irish aristocratic family as the only son of Charles Boyle, 2nd Earl of Burlington and his wife, Juliana Noel (1672–1750). Often known as "the Architect Earl", Burlington was instrumental in the revival of Palladian architecture in both Great Britain and the Kingdom of Ireland. He succeeded to his titles and extensive estates in Yorkshire and Ireland at the age of nine, after his father's death in February 1704. During his minority, which lasted until 1715, his English and Irish lands and political interests were managed on his behalf by his mother and guardian, the Dowager Countess Juliana. He showed an early love of music. Georg Frideric Handel dedicated two operas to him while staying at his residence Burlington House: Teseo and Amadigi di Gaula. According to Hawkins, Francesco Barsanti dedicated the six recorder sonatas of his Op. 1 to Lord Burlington, although the dedication must have appeared on the edition sold by Peter Bressan, before Walsh & Hare engraved the works c. 1727. Three foreign Grand Tours taken between 1714 and 1719, and a further trip to Paris in 1726, gave him opportunities to develop his taste. His professional skill as an architect (always supported by a mason-contractor) was extraordinary in an English aristocrat. He carried his copy of Andrea Palladio's book I quattro libri dell'architettura with him when touring the Veneto in 1719, but made notes on a number of blank pages, having found the region flooded and many villas inaccessible. It was on this tour that he acquired the passion for Palladian architecture. In 1719, he was one of the main subscribers of the Royal Academy of Music, a corporation that produced baroque opera on stage. Lord Burlington's first project, appropriately, was one of his own London residences, Burlington House, where he dismissed his baroque architect James Gibbs when he returned from the continent in 1719, and employed the Scottish architect Colen Campbell, with the history-painter-turned-designer William Kent assigned for the interiors. The courtyard front of Burlington House, prominently sited in Piccadilly, was the first major executed statement of Neo-Palladianism. In the 1720s, Burlington and Campbell parted, and Burlington was assisted in his projects by the young Henry Flitcroft ("Burlington Harry"), who developed into a major architect of the second Neo-Palladian generation, Daniel Garrett, a straightforward Palladian architect of the second rank, and some draughtsmen. Lord Burlington never closely inspected Roman ruins or made detailed drawings on the sites; he relied on Palladio and Scamozzi as his interpreters of the classic tradition to do so. Burlington's Palladio drawings include many reconstructions of Vitruvius' Roman buildings, which he planned to publish. In the meantime, he adapted the palazzo facade in the illustration for the London house of General Wade at Old Burlington Street in 1723, which was published for Vitruvius Britannicus iii (1725). This publication put a previously unknown Palladio design into circulation. Another source of his inspiration were drawings he collected, some drawings of Palladio himself which had belonged to Inigo Jones, and many more of Inigo Jones' pupil John Webb, which William Kent published in 1727 (although a date of 1736 is generally accepted) as "Some Designs of Mr Inigo Jones"... with some additional designs that were by Kent and Burlington. The important role of Jones' pupil Webb in transmitting the palladian-neo-palladian heritage was not understood until the 20th century. By the early 1730s, Palladian style had triumphed as the generally accepted manner for a British country house or public building. For the rest of his life, Lord Burlington was "the Apollo of the arts" as Horace Walpole phrased it— and Kent, "his proper priest." In 1739, Lord Burlington was involved in the founding of a new charitable organisation called the Foundling Hospital. Burlington was a governor of the charity, but did not formally take part in planning the construction of this large Bloomsbury children's home, completed in 1742. The architect for the building was a Theodore Jacobsen, who took on the commission as an act of charity. Many of Lord Burlington's projects have suffered from rebuilding or additions, from fire, or from losses due to urban sprawl. 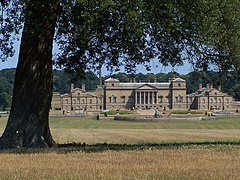 In many cases, his ideas were informal: at Holkham Hall, the architect Matthew Brettingham recalled that "the general ideas were first struck out by the Earl of Burlington and the Earl of Leicester, assisted by Mr. William Kent." Brettingham's engraved publication of Holkham credited Burlington specifically with the ceilings for the portico and the north dressing-room. Lord Burlington's architectural drawings, inherited by his son-in-law, William Cavendish, 4th Duke of Devonshire, are preserved at Chatsworth House, and enable attributions that would not otherwise be possible. In 1751, he sent some of his drawings to Francesco Algarotti in Potsdam, together with a book on Vitruvius. Palazzo facade drawn by Andrea Palladio, purchased in Italy by Inigo Jones. Burlington purchased it from the heirs of Jones' pupil John Webb and adapted it for the London house of General Wade. Note the Palladian window. Colen Campbell's Burlington House as it was in 1855, before a third storey was added. Plate 72, Cross-section of Octagon at Chiswick House, Richard Boyle, 1727, V&A Museum no. 12957:33. Burlington House, Piccadilly, London: Lord Burlington's own contribution to the house is likely to have been restricted to the former colonnade (demolished 1868) of the building. A monumental screening gateway to Piccadilly was built and the principle interiors of the house were reconstructed with typical Palladian features. In London, Burlington offered designs for features at several aristocratic free-standing dwellings, none of which have survived: Queensbury House in Burlington Gardens (a gateway); Warwick House, Warwick Street (interiors); Richmond House, Whitehall (the main building). Tottenham House, Wiltshire, for his brother-in-law, Charles Bruce, 3rd Earl of Ailesbury: Built from 1721, executed by Lord Burlington's protégé Henry Flitcroft (enlarged and remodelled since). In the original house, the high corner pavilion blocks of Inigo Jones' Wilton House were provided with the "Palladian window" motif to be seen at Burlington House. Burlington, with a good eye for garden effects, also designed the ornamental buildings in the park (now demolished). 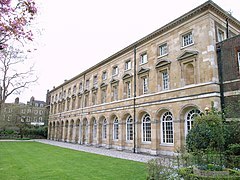 Westminster School, the Dormitory: Built between 1722 – 1730 (altered, bombed, and restored), the first public work by Lord Burlington, for which Sir Christopher Wren had provided a design which was rejected in favor of Burlington's, exhibited as a triumph for the Palladians and a sign of changing English taste. Old Burlington Street, London: Houses, including one for General Wade which was built in 1723 (demolished). General Wade's house rendered the genuine Palladio facade in Lord Burlington's collection of drawings. Waldershare Park, Kent, the Belvedere Tower: Built between 1725 – 27. A design for an eye-catcher garden that might have been attributed to Colen Campbell were it not have been for a ground plan found among Lord Burlington's drawings at Chatsworth House. 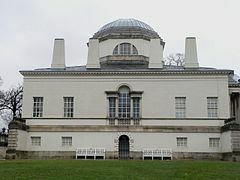 Chiswick House Villa, Middlesex: The "Casina" in the gardens, constructed in 1717, was Lord Burlington's first essay. 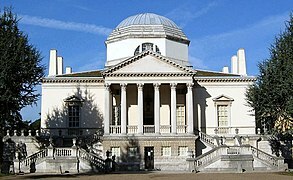 The villa, built between 1727 and 1729, is considered to be the finest remaining example of Neo-Palladain architecture in London and one of the gems of European 18th-century architecture. An attempt made by Burlington to create a Roman villa situated in a symbolic Roman garden. He built the villa with enough space to house his art collection, regarded as containing "some of the best pictures in Europe", and his more select pieces of furniture, some of which was purchased on his first Grand Tour of Europe in 1714. Sevenoaks School, School House: Built in 1730. The school depicts classic Palladian work, commissioned by Lord Burlington's friend Elijah Fenton. The York Assembly Rooms: Built between 1731 – 32 (facade remodelled). In the basilica-like space, Lord Burlington attempted an archaeological reconstruction "with doctrinaire exactitude" (Colvin 1995) of the "Egyptian Hall" described by Vitruvius, as it had been interpreted in Palladio's Quattro Libri. The result was one of the grandest Palladian public spaces. Kirby Hall, Yorkshire (an elevation). Burlington married Lady Dorothy Savile on 21 March 1720, the daughter of William Savile, 2nd Marquess of Halifax and his second wife, Lady Mary Finch. Mary was the daughter of Daniel Finch, 2nd Earl of Nottingham and Lady Essex Rich (d.1684). Essex was the daughter of Robert Rich, 3rd Earl of Warwick and Anne Cheeke. Anne was the daughter of Sir Thomas Cheeke of Pirgo and a senior Lady Essex Rich (d.1659). The elder Lady Essex was the daughter of Robert Rich, 1st Earl of Warwick and Lady Penelope Devereux. Essex was probably named after her maternal grandfather Walter Devereux, 1st Earl of Essex. Her maternal grandmother was Lettice Knollys. 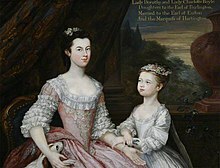 Lady Dorothy Boyle (14 May 1724 – 2 May 1742). She was married to George FitzRoy, Earl of Euston, second son of Charles FitzRoy, 2nd Duke of Grafton and Lady Henrietta Somerset. No known descendants. Lady Julianna Boyle (1727 – 1730). Lady Charlotte Elizabeth Boyle (27 October 1731 – 8 December 1754). She married William Cavendish, Marquess of Hartington (later Duke of Devonshire after her death). They were parents to William Cavendish, 5th Duke of Devonshire, George Cavendish, 1st Earl of Burlington, and two other children. Burlington died at Chiswick House, aged 59. 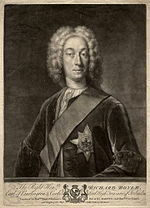 Upon his death, the Earldom of Cork passed to a cousin, John Boyle, and the title of the Earl of Burlington became extinct. It was recreated in 1831 for his grandson, George Cavendish, and is now held by the Cavendish family as a courtesy title for the Dukes of Devonshire. ^ Bolton, Diane K.; Croot, Patricia E. C.; Hicks, M. A. (1982). "Chiswick: Economic history". A History of the County of Middlesex. 7. London: Victoria County History. pp. 78–86. Retrieved 27 June 2017. ^ Burlington to Sir Andrew Fountaine, 6 November 1719; quoted by Clark, J., in Barnard & Clark (eds) 'Lord Burlington, Architecture, Art and Life', 1995, 268. ^ Deutsch, O.E. (1955), Handel. A documentary biography, p. 91. Reprint 1974. ^ MacDonogh, G. (1999) Frederick the Great, p. 192, 233–234. ^ Hewlings, Richard. 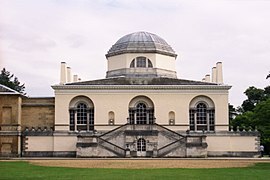 "Chiswick House and Gardens: Appearance and Meaning" in Toby Barnard and Jane Clark (eds) Lord Burlington. Architecture, Art and Life (London, Hambledon Press, 1995), pages 1–149. ^ Bryan, Julius (1993). London's Country House Collections. Kenwood, Chiswick, Marble Hill, Ranger's House. London: Scala Publications for English Heritage. p. 36. Howard Colvin (1995). Dictionary of British Architects. 3rd ed. Handel. A Celebration of his Life and Times 1685 – 1759. National Portrait Gallery, London. Wilton-Ely, John (Intro. ), Apollo of the Arts: Lord Burlington and His Circle. Nottingham University Art Gallery. 1973. Exhibition catalogue. Chapter 8: Lord Burlington and William Kent. Chapter 9: Lord Burlington's Work at York. Chapter 10: Lord Burlington at Northwick Park. This page was last edited on 14 February 2019, at 14:09 (UTC).